Following their huge success in the 1970's with the Original 16 Series, Topps tried to recreate the wacky craze with new sets of Wacky Packages throughout the 1980's and early 1990's. There were some good original ideas and designs with these later stickers, however many were simply reprints or rehashes of the Original Series stickers and the artwork just isn't quite the same. The Original Series stickers of 1973-1976 continue to be the main focus of wacky fans and collectors, but these 1979 and Newer Wacky Packages are interesting and fun to collect as well. Summary: Topps reissued 264 stickers from the original 16 series and created 4 new series. These are easily distinguishable from the originals because they are numbered and have puzzle or checklist backs. Ice Krunkles Cereal was only new title in the entire set. Summary: Topps issued a set of 120 stickers and album to stick them in. These stickers are smaller then previous wacky stickers, are numbered 1-120, and the checklist only appears in the 22 page album. Mostly reprints from the original 16 series, the only new titles are Crookie Crisp, Laffelos, Dinky Gonuts, Whale O's and Schnozmopolitan. Summary: There are many new titles in this set, such as TV Ghoul. Sometimes an old product was used with a new title. The stickers are numbered 1-44 and their backs form 2 puzzles (blue border Beastball and red border Batzooka). Summary: This set was tested, but never mass-marketed. The stickers are the same size as the 1982 Album stickers, but were printed on much heavier stock. They are numbered 1-77 and there are no checklists or puzzle. The album for this set was actually never released. There were no new titles, just reprints from the 1982 and 1985 sets. Summary: There were many new titles in this set. The stickers are numbered 1-55 and there is a combination of puzzle backs, checklist backs and parody cents-off coupons backs. 11 stickers have 2 different backs. 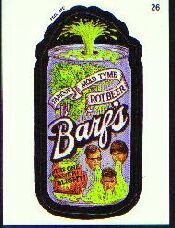 Sticker #26 Tattoo Skins was replaced towards the end of production by Barfs Root Beer. Summary: The Lost Wackys, as they call them, were designs never released by Topps. There were 4 of them: Midget Rice, Monsterettes, Fool-Aid and Buggies. Duane Dimock purchased the artwork at a Topps auction and had them printed up. You can purchase them at his web site. Summary: The Irish Set, as they call it, were wacky packages distributed in the United Kingdom (Ireland and England). 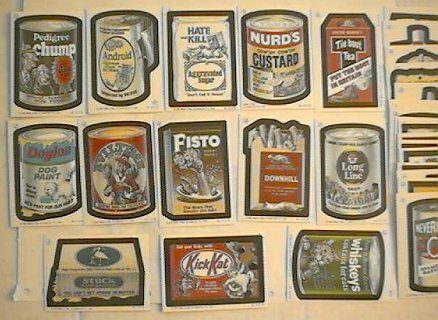 Most of the titles are from the US wacky packages, but 13 of them were unique designs from products in the U.K. The copyright on these stickers says 1982, but they were not distributed until early 1990.